THE Batch Fryer consistently produces perfect kettle style potato chips, according to Heat and Control Pty Ltd .
With no heat transfer tubes immersed in the oil, the unique under-pan fired design allows cooking with as little as 4" of oil depth. Superior oil quality is achieved as low oil volume produces rapid oil turnover for the freshest chips, with the longest shelf life. For convenience, automatic oil level control continuously compensates for oil carried out of the fryer with finished chips. For repeatable quality in each batch, a Programmable Logic Controller automatically controls potato feed, stirring, finished chip unloading and initiation of the next batch. Using traditional low temperature cooking, the standard models are able to produce 180 and 360lbs/hr of finished hard bite, kettle style potato chips. In addition, Heat and Control can custom design a fryer to suit unique production needs. The flat bottom stainless steel pan has no heating elements to burn and trap product particles. Raising the drain conveyor by the screw jack hoist provides complete access for cleaning. Therefore, cleaning of the Batch Fryer is easy and effortless. Heat and Control’s optional Chip-Stirr system stirs slices automatically during cooking and then directs the finished chips to the discharge/drain conveyor. Eliminating the costly and hazardous task of manual stirring, the Chip-Stirr prevents slice clusters, allows one operator to monitor multiple fryers and assures consistent chip quality from batch-to-batch. Delivered ready to run, the complete combustion system is piped, wired and ready for connection to the natural gas line. Therefore, installation cost and time is reduced. 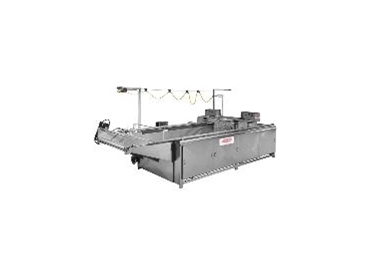 Optional features include: Chip-Stirr automatic slice stirring system, batching hopper for repeatable batch sizes, bi-directional conveyor feeds slices to two fryers and hood assemblies to enclose the cooking area. Heat and Control provides complete potato preparation, finished chip seasoning, distribution and packaging systems.